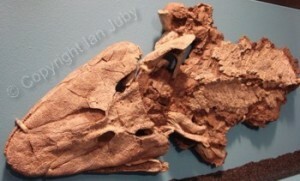 For those not familiar with it, Tiktaalik is a fossil creature found in the Canadian high arctic in 2006, and was immediately claimed by researchers, such as evolutionary biologist Prof. Neil Shubin of University of Chicago, to be a transitional form between a fish and a land dwelling animal. A New York Times article, 5 April 2006, on the discovery was devoted to mocking creationists by calling it a “fishapod”. According to evolution theory, fish grew legs and took up walking on land. The first land animals are assumed to have been amphibians with four feet and are therefore called tetrapods. (tetra for four, pod for feet). The alleged half-fish/half-tetrapods were therefore nicknamed “fishapods.” If fish really did evolve into tetrapods over tens of millions of years, and only one body in a million was preserved then there should be copious numbers of fossil fishapods from such vast periods of evolving transitional forms. Instead, the ones used in official charts (as below) are few and far between, as a result of innumerable “missing links” in the chain of alleged evolution from fish fin to fish foot to legged amphibian – from water to land creature. The creatures on the left are “older” and supposed to be developing four feet as they evolved over time into the creatures on the right. Notice in the chart of the transitional forms there appears to be no order to the alleged evolutionary progression – this family tree has no real sequence – and this is using both the timeline and evidence provided by the evolutionists! 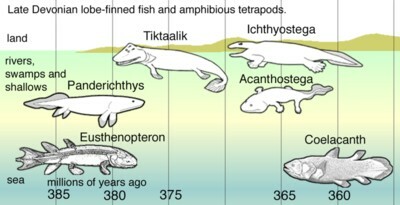 Before Tiktaalik was discovered, there was an additional gap in the chart above. So the evolutionary palaeontologists predicted that if evolution were true, they should find an appropriate fishapod in rocks around 375 million years old, according to the evolutionary time scale. (1) When a team of palaeontologists went to Ellesmere Island in the Canadian Arctic to look for such intermediates in “Devonian” rocks, they found Tiktaalik – a creature which shared traits with both the fishes and tetrapods. In particular, it’s “legs” had bones very similar to tetrapod limbs. Tiktaalik made a huge splash in the press. 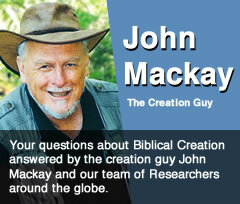 Evolution had not only been “proven,” but based on evolutionary theory, a prediction had been made and fulfilled! In fact Tiktaalik was such a sensation that it was given its own website! So does Tiktaalik really provide good evidence that fishes evolved into land creatures? 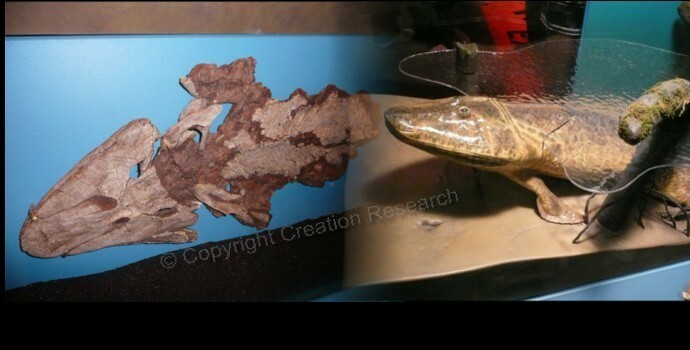 Let’s start by comparing the photo of the actual fossil remains with the drawing of Tiktaalik in the diagram above, and note what is evolutionary speculation, and what is hard evidence. Nothing was found of the back end of the creature. We have no idea if it had limbs back there or not, or if it had a tail or not. Everything on the tail end of Tiktaalik in the drawing is speculation based on evolutionary theory and assumptions. There isn’t much remaining from Tiktaalik’s fin/flipper/foot, but yet the evolutionists made use of homology to interpret the bones in its fin/flipper/foot and compared it to the legs of tetrapods. Yet even the Chicago Field Museum called Tiktaalik’s limbs a “fin.” No actual “foot” was found. Such speculations cannot be considered as evidence, not even for evolution. However, the Polish footprints are actually old news. 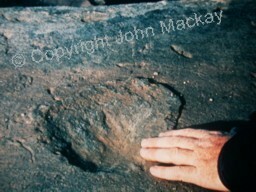 Many years ago, John Mackay discovered what appeared to be fossil tetrapod footprints in the Cambrian Tapeats Sandstone of the Grand Canyon – rocks that according to evolutionists are 525 million years old. John shared these photos in print in 1987/88. I personally went and investigated the evidence myself, and documented around 40 fossil footprints at Tonto point. My conclusion is the footprints were identical to the tetrapod footprints of the famous Coconino sandstone of the Grand Canyon. 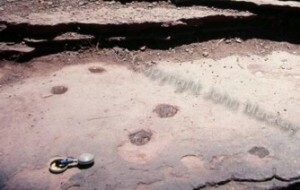 The evolutionary community of course rejects the Tapeats fossil footprints, but the Coconino prints are well known and not controversial, evolutionarily speaking. At one presentation of my Tapeats footprint slides, one skeptic publically accused me of being a liar, claiming I must have been showing fossil footprints from the Coconino sandstone yet falsely claiming I found them in the Tapeats. Yes, that is how identical the fossil footprints were! See comparison picture below. When I proved that the footprints I was showing were in the Tapeats sandstone, the skeptic then changed his story to claim these were not footprints. Why? Moments prior, he had no doubt they were footprints, in fact he was adamant they were genuine footprints and that proved I was a liar. The reason the evolutionary community rejects the Tapeats sandstone footprints as genuine tetrapod tracks is because they refute evolutionary theory, placing tetrapods 200 million years prior to the alleged evolution of the fishapods. Instead, this is powerful evidence that tetrapods have been around since the beginning of time, and that there is no evolutionary sequence. The evidence shows that creation is the faith that fits the facts, and evolution is the faith which has failed to fit the facts. Finally, my short response is with my own question: How now is Tiktaalik evidence that fishes evolved into land creatures?